The Interfaith Community Sanctuary in Ballard (Seattle), Washington hosts my exhibit of 11 paintings and 9 odes, Al-Andalusia: Pardes/Paradise, through the second Sunday in November. It will be enjoyed by the larger commnity on Saturday September 21, International Day of Peace. The Interfaith Community Sanctuary welcomes all religions. It was co-founded by Imam Jamal Rahman and Karen Lundquist. Imam Jamal Rahman has been featured in the New York Times, on CBS News, the BBC and various NPR programs. He is an adjunct faculty at Seattle University, a former host of Interfaith Talk Radio and travels nationally and internationally, presenting at retreats and workshops. Reverend Karen Lindquist serves the community as Interfaith Worship Program Coordinator and brings guests from diverse spiritual and faith traditions to share a Message on the first Sunday each month. She also co-creates many interfaith services throughout the year with faith and spiritual communities and interfaith organizations in the greater Seattle area. Rev. Karen Lindquist was the 2012 Honoree of the Father William Treacy “Models-of-Hope” Awardpresented on December 8th 2012 at the 10th annual Interfaith Summit held at Cascadian Center at Camp Brotherhood in Mt. Vernon, WA. — an ancient, indigenous spiritual practice spontaneously revived through mystical and prayerful experiences entered into by Rumi. 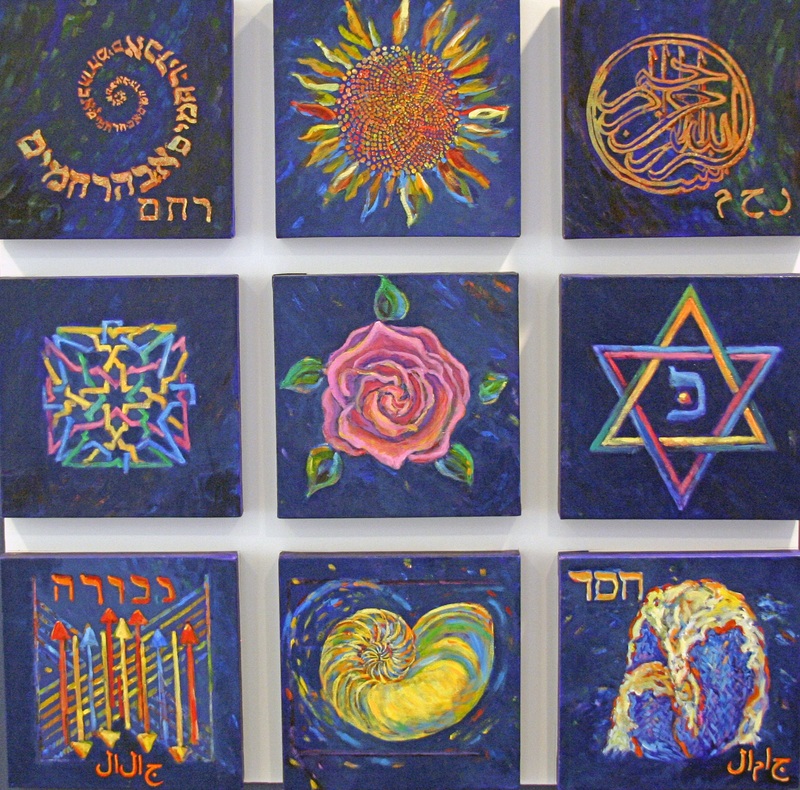 I am pleased that the exibit will also be up during the presentation of Friends of the Charter for Compassion, an offshoot of Karin Armstrong’s efforts to spread the Common Ground of all religions as the Golden Rule. Categories: About Exhibits | Permalink. introducing the artists who attended the reception. Categories: About Exhibits | Tags: "Sacred Voices" Exhibit, Canton Ohio Museum of Art | Permalink. The Curator of the Canton Museum Exhibit “Sacred Voices” asked me to send an estimate of shipping and insurance costs to Ohio. Since the painting was sold a few months ago to a collector, I did not have it to weigh but I did have a selection of 9 12″ x 12″ empty canvases, the same format as the painting. I found the proper box, put the canvases in, drove to FED EX and they weighed and gave me an estimate. What fun to tell the helper at FED EX, when she asked, that I am sending a painting to a museum. The next step will be to pick up the art from the collector, who is happy to loan it for the exhibit. from December 2013 to March 2014. 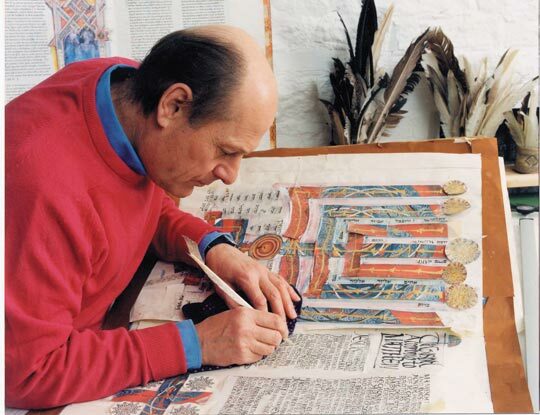 Sacred Voices is planned as a companion exhibit concurrent with The St. John’s Bible, a phenomenal undertaking by a team of artists coordinated by Donald Jackson to create the entire Bible in the ancient illuminated manuscript tradition. The project was commissioned in 1998 by the Benedictine monks of St. John’s College in Minnesota. The Saint John’s Bible is a work of art and a work of theology. A team of artists coordinated by Donald Jackson in Wales and a team of scholars in Central Minnesota have brought together the ancient techniques of calligraphy and illumination with an ecumenical Christian approach to the Bible rooted in Benedictine spirituality. The result is a living document and a monumental achievement. Categories: About Exhibits | Tags: juried exhibit, museum exhibit | Permalink. Al-Andalus: Pardes/Paradise in Washington, D.C. Here is a taste of Al-Andalus: Pardes/Paradise as exhibited at the Jerusalem fund Gallery of the Palestine Center in Washington, D.C. September/October 2012. Click on Pomegranate Tree of Life to see all of the art created for Al-Andalus: Pardes/Paradise. The Gallery of the Jerusalem Fund for Education and Community Development, Washington, DC hosted my paintings and odes: Al-Andalusia: Pardes/Paradise from September 14 thru October 26, 2012. I attended the Opening Reception and gave a brief presentation. My flight on September 11, 2012 coincided with the attack on the US Consulate in Bengazi, Libya and the deaths of US Ambassador Chris Stevens and computer expert Sean Smith. The exhibit was very well received. It was preceded by the optimism generated by the events of The Arab Spring. However, on arrival at the gallery to meet with the gallery director, Dagmar Painter, all of the hundreds of United States flags in the US Capitol were at half-mast. It was a sobering sight. The Jerusalem Fund Gallery is a program to promote Palestinian and Arab culture through art exhibits, book signings, musical performances and other events. The events are held at The Jerusalem Fund office in Foggy Bottom, Washington, D.C, across from the Watergate Complex. The Jerusalem Fund for Education and Community Development is a 501(c)(3) non-profit organization based in Washington D.C. that does educational and humanitarian work on behalf of Palestinians, particularly those living in the Occupied Territory and surrounding refugee camps. Categories: About Exhibits | Tags: Andalusia, Interfaith Art | Permalink.